Pan flutes or panpipes as some prefer to call them make a dreamy sound like this beautiful, authentic Hawaii one to the left. 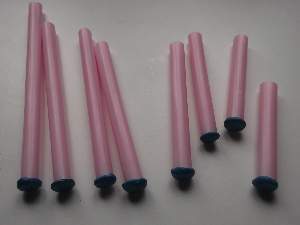 However, you will be fascinated how easy it is to make and play this homemade musical instrument out of jumbo straws called bubble tea straws. To get them to play up the musical scale, you need to measure and cut accurately. 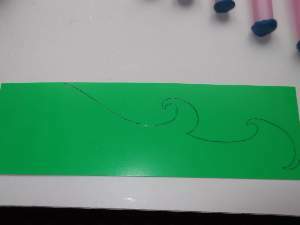 What I did was cut the first as accurate as possible and then cut all the others slightly longer than their measurement. I then closed the bottom of each one to test the pitch. If the note was too high, I just clipped off a small amount until it was correct. If that is too hard to do, then just cut them to the following measurements. To cut the flutes start with the longest. You can probably get the last 2 from one straw. 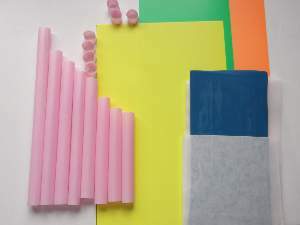 Don`t throw away the excess as you will cut it into small pieces to separate each flute. 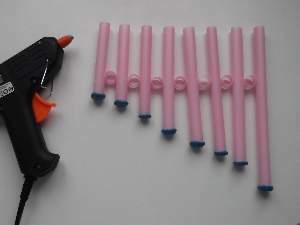 You need to close the end of each pipe so roll a small piece of blue tac or something similar like molding clay into a ball and flatten it between you thumb and finger. Stick it on the end and blow over the top of the flute. If it doesn`t play keep trying at different angles until you hear a note. 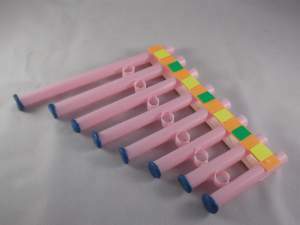 When your happy with your flutes you can use the small pieces like circles to join and separate them making it easier to play. Use the help of an adult with the glue gun as it can get pretty hot. Some pan flutes have a design running across the top which I think looks kool. You can keep it straight or cut it into an eye-catching shape. Use several colors or decorate it with glitter and paint. See one below that was crafted by a young girl in our Summer Craft Workshop that started July 23rd. 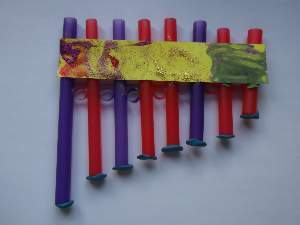 See other homemade musical instruments that you can make for a kids crafts project.